We all want our cats with us at any time given and we must admit these strollers make that a lot easier. We would like to help you choose the best cat stroller for your four-legged furball by providing reviews, how-tos for using strollers, buying tips, things you need to be cautious about when buying and much more. Basically, we have done all the research for you, so you don’t have to lose your precious time scrolling through various pages that might or might not fool you. What every cat owner wants for their furry friend is an extremely reliable and comfortable transport to any destination. Whether it is a small stroll or a long trip, our pets deserve the best comfort we can afford them. Before you buy any product, it is always helpful to look out for the best option given. Considering that strollers are not an inexpensive item, you need to be very careful and mindful when picking out. We will point you towards some of the things you need to look for when buying a cat stroller. First off, you should know that there are strollers of various sizes. 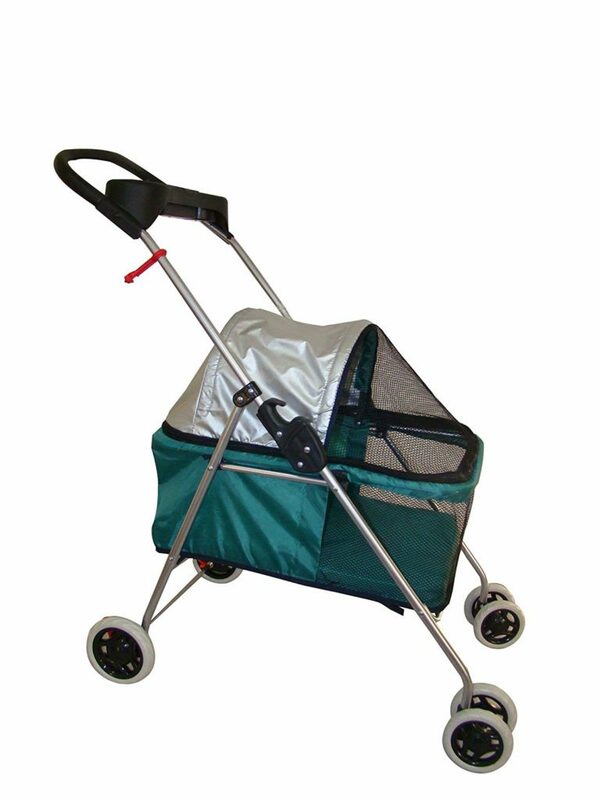 You need to know that these strollers can be used for any pet you can think of. Therefore, you must be careful and look at the actual sizing and probably measure the width, height and depth according to your cat. You will not need a huge stroller since cats are smaller than dogs. It is very important that your cat has enough space in a stroller so it isn’t too tight, nor too spacious. What you need to be aware of are possible Internet scams when buying online. This means that somebody might write ‘cat stroller’ in the description, when in reality it is a huge stroller meant for dogs. This tip is particularly meant for buying already used strollers or thrifted ones. There are too many uses for pet strollers and knowing what you will use it for is one of the key points when buying. Is it just going to be for a casual walk around the neighborhood or shopping? Maybe for a mountain hike? Will you need it for car trips or long travels? Are you going to need a stroller for more than one pet? All these questions are also the answers to what kind of stroller you should be looking for. Let us explain. If you are going on a trip, you might look for a stroller that can be folded and stored so it doesn’t take up much space. Also, in this case you can find a stroller that converts into a car seat. If you like going for bike rides, well there are strollers that can be attached to bikes and you can ride with your buddies by your side. For us that have more than one cat, there are extra wide strollers or the ones with double seat. 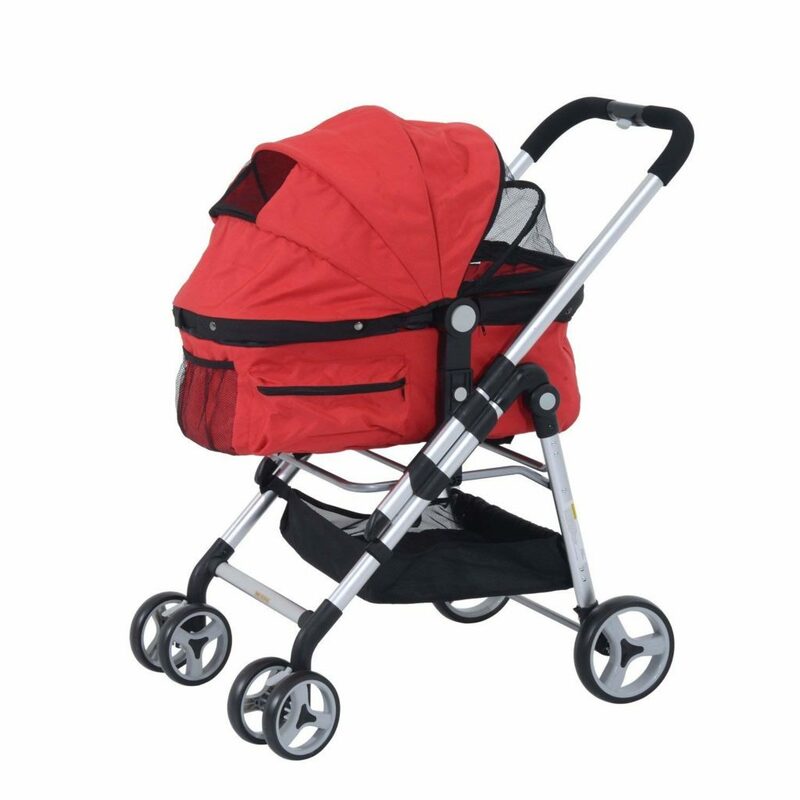 Rough and bumpy terrain will require durable stroller and one with excellent wheels. On the other hand, paved paths and sidewalks don’t require as much. A basic model with small wheels wouldn’t quite work while jogging or hiking, but a model fit for rough paths would be as good on smooth paths. These two must be addressed together, since sadly, price tells you a lot about the quality and vice versa. If you just need a stroller for casual walks and nothing too serious, you can buy an inexpensive stroller without many additional items that could rise the potential price. Also, when buying a stroller of lower price, you can’t always expect comfort. We can also talk about quality if we mention all the additional things that go with strollers. Those could be cup holders, extra space for personal belongings, specific fabric of strollers, colors, patterns, number of wheels or seats. All of these things contribute to the quality of a stroller. But they also contribute to the price! Now, we all need to pay attention to this one. It is extremely important for all of us to keep our cats as safe as they can be. Keeping in mind that even the calmest cat could get stressed in unfamiliar surroundings, we must find the right stroller which could prevent any sudden movement. Harness – we would recommend putting one on your pet when in the stroller and also attaching a leash to it to hold on to it while moving. Many strollers come with tether that attaches to the ring on a harness or a collar, so this can come in handy for some extra safety. Locking wheels – Imagine being on a slight slope and stopping to have a chat with someone, but not holding on to your beloved pet and the stroller starts to roll downhill and… Oops! That’s an unfortunate outcome. Luckily there is this safety feature called rare locking wheels. Whether you are just stopping by or even using public transportation, we consider it is smart to use that break and prevent any possible disasters. However, just in case, you might still want to keep your grip on the stroller and be completely in charge. Bike trailer – You are using a trailer attached to a bike? Not a problem, but you will need a few more features for extra safety. One of those features are rare view mirrors on your handlebars. Now, this feature will provide you constant view on what is going on behind you. Den – If you are planning to go to the festival or busy streets, you should think about creating a den in your stroller. The stroller you choose should have a zipper or other type of closing to secure the folding canopy to the body of the stroller. Cover – Weather can be a huge annoyance sometimes. Whether it is sudden rain or extremely hot and sunny day you will be in a desperate need for some kind of a cover. This is why we recommend having some water and wind-proof cover. We don’t want our little furry friends panicking because of the weather. Overall, you should take safety of the stroller very serious. Checking all the canopies whenever you intend to go basically wherever. Also, you should check for the gaps in the fabric because you never know what your little fur friend has been doing to it while you weren’t watching. One more thing to mention here is that if your cat hasn’t been in any kind of a stroller before, then a bike trailer probably isn’t the best way for it to start getting familiar with this mean of transport. Our advice is to start off with more quiet streets and basic walks and when your little fellow gets used to and comfortable with it, then you should move on to something bumpier or more crowded. We wholeheartedly suggest you read reviews. Now, we don’t say you should completely rely on them, but they can be of a great help. You would want to go for a stroller with numerous positive reviews and the ones with a high rating. Reviews are a great way to see how much a product differs from what manufacturers have told you about it and what it actually looks like from user’s point of view. We advise you to read a few feedbacks about the stroller you have intended to buy and maybe see the pictures of how it actually looks like. Our idea was to provide you with an article that won’t make you search for more reviews after reading our entire blog about strollers, because we absolutely tried to research all those reviews and bring to you our final work. 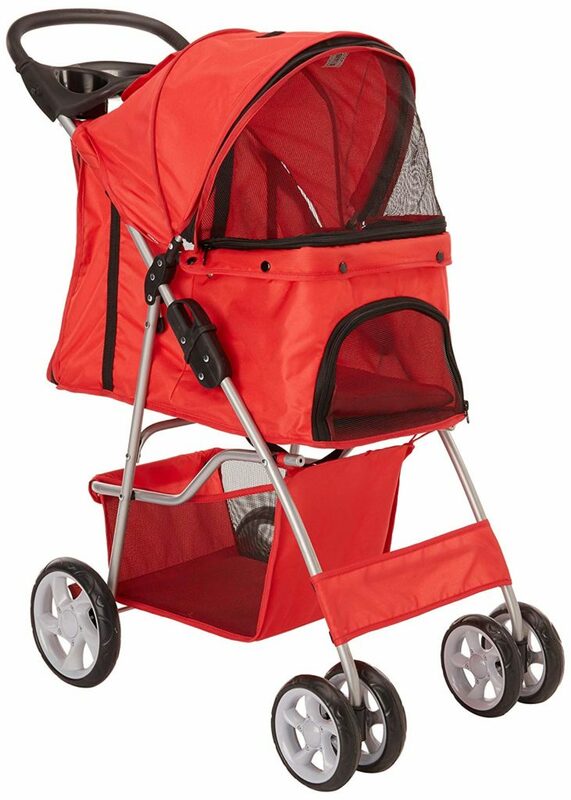 Let’s start with Paws & Pals 3 Wheeler Elite Jogger – this stroller is perfect for larger cats or families with several cats. It can also be great for people with senior cats that can’t go for long distance walks. Additionally, this stroller is super affordable compared to some other less functional strollers! Your furry friends can be easily loaded via the front zip entry and front foot-board step or you can use the back zip to load and unload your cat. While strolling around in the convertible mode with the canopy down, be sure to use the leash clip so your pet doesn’t make a fast escape. With the press of a button on the handle the stroller folds compactly, making this a great option for travel. When folded completely, the stroller takes minimal space to store. The stroller features a pet stroller with two rear wheels and one front wheel,plus two pins to secure rear wheels in place. It also, comes with metal washers, hardware, one cup holder, a foot-board, a water resistant bed, one leash clip and a holding hook on the handle. It is very roomy and comfortable, safe for your cats. The dimensions of the stroller are 15’’ x 20’’ x 40’’ Inches. When folded, the stroller is 32’’L x17’’W x 11’’H, and the stroller without the carriage is 34’’L x 18’’W x 40’’H. Also, the carriage alone is 21’’L x 14’’W x 19’’H. 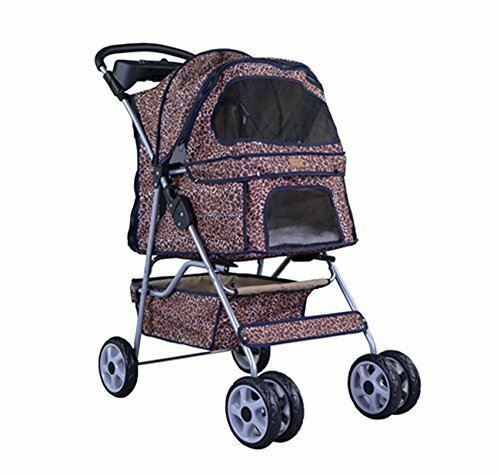 If you are someone who has several cats or a larger one, this Paws & Pals 3 Wheeler Elite Jogger is perfect for you. You won’t have to worry about your buddies comfort or safety. Oh, and it comes in two colors, black and pink, so you can choose whichever color you prefer! The next one on our list of strollers is Paws & Pals City Walk N Stride 4 Wheeler. This stroller can be used for both cats and dogs. It is sturdy and comfortable and it is most definitely safe to use for both you and your pets. One of the upsides of this stroller is it’s inexpensiveness. This stroller features multiple mesh screens with zippers for easy access and breath-ability to protect your cat from insects and provide adequate ventilation. It’s equipped with a cup holder for refreshments and an undercarriage for toys and snack storage. It also has a retractable, waterproof rain hood that will protect your cat from rain and other weather conditions. 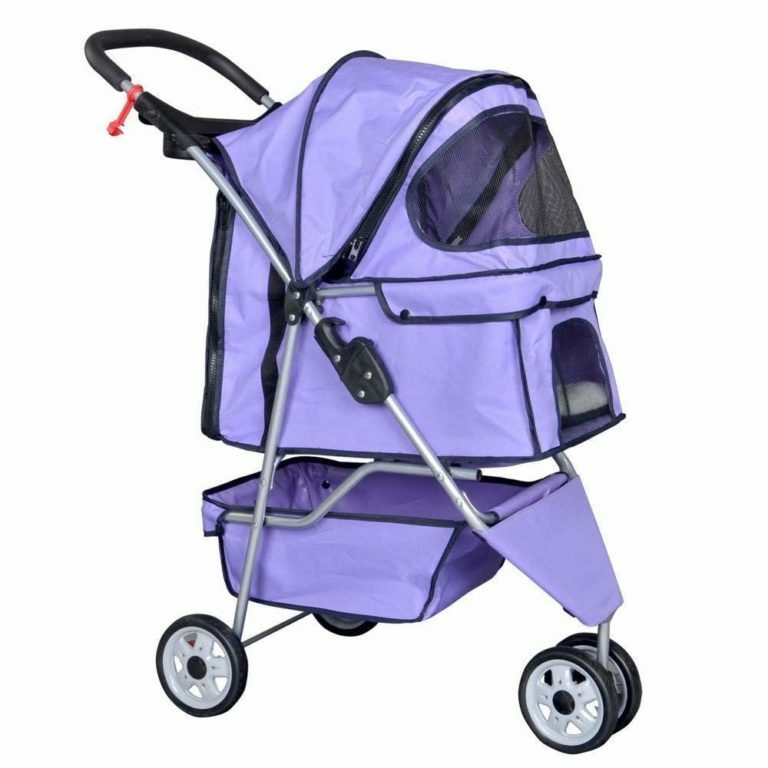 In addition, it has both front and rear entry, so you can easily place your cat inside the stroller. The dimensions of this stroller when folded are length 32’’, width 17’’ and hight 11’’. The carriage without the stroller is 21’’L x 14’’W x 19’’H, and the stroller alone is 34’’L x 18’’W x 40’’H. Also, if this stroller comes in some crazy colors, if you are fed up with plain old black and gray versions. This stroller comes in red, purple, pink and of course, black. Because of strollers like this, we no longer need to leave our cats at home while we enjoy the beautiful days. 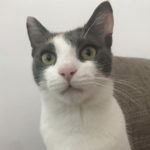 We can take our furry friends shopping, for a walk down the block or to go jogging in the park, all this and without worrying about the comfort and safety of our cats. So, if you choose this stroller you get both great quality and great price! What more can you want for your cat! If you’re the owner of medium sized felines then the right stroller for you is the VIVO Four Wheel Stroller. This stroller provides first class travel for your furry companion, no matter whether you are taking a quick stroll around the block or a jog through the park. It’s durable 4-wheels will make for a safe and smooth ride and a comfy, padded interior bottom will keep your cat happy. The stroller features two front windows and back window which are made of mesh that is fully breathable and that also creates a great viewing. The top mesh window allows you to keep an eye on your happy cat. The top of the carrier collapses back to create a large opening. Other stroller features include dual cup holders and a center tray for storing doggie snacks or personal belongings like cell phone and keys. The entire cart is fully collapsible which is activated by two latches located on the sides. The stroller comes in several different colors including black, purple, green, blue, pink-white polka dot and pink camouflage pattern. However, compared to two previous strollers, this one is just a bit pricier. Tons of window space and easy zipper access points. Open windows and mesh material provide an abundance of air flow for your cat. Simple release buttons on either side collapse the entire stroller into nice compact form. Perfect for long term storage or packing for road trips. Sturdy 4-wheel system for smooth rolling. Back wheels feature locks to keep stroller stationary when desired. Large 16 x 12 x 7 inches under basket for additional storage. Perfect for medium-sized cats, this stroller has everything your cat needs to feel completely at ease. It has tree different entry areas so loading your pet in shouldn’t be a problem. Additionally, it provides tons of space and an abundance of air flow, so no worries that your cat’ll feel claustrophobic! If you are someone who absolutely abhors zippers, then this stroller is made for you and your cat! No zippers – no hassle when opening and closing the stroller. Pet Gear No-Zip NV stroller provides easy access to your cat without fumbling with those horrible zippers! The NV Pet Stroller also features an elevated paw rest. Your cat can easily look out of the stroller by using the front bar for support. Thanks to the front locking wheel, the stroller navigates over rough terrain with ease no matter whether you’re jogging or strolling. Additionally, the new panoramic view window allows your cat to remain safe inside of the stroller without missing any sights along the way. Other features of this stroller also, include a plush bolster pad, air tires for a smoother ride, and new stylish colors and embroidery! The inside padding comes in three different patterns Dalmatian, rose and sky line. 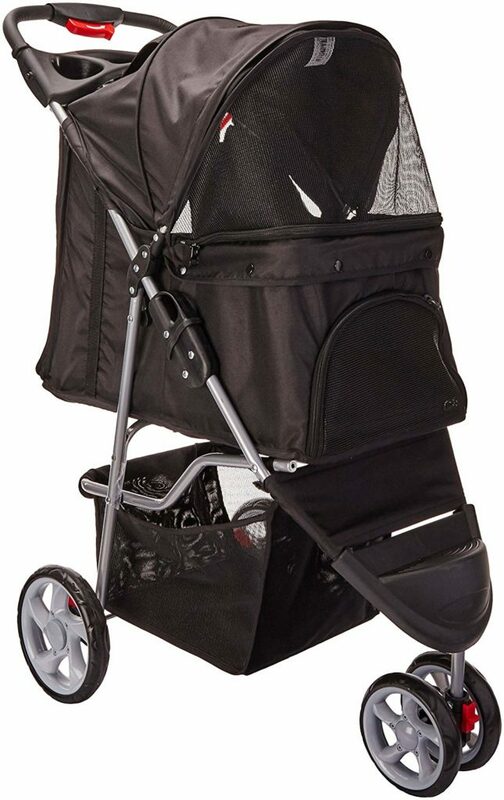 However, the outside color of the stroller comes only in black! The only downside of this stroller is it’s price. We’re just going to say that it’s on the pricier side! The comfort of your cat should come first! That’s why the NV Pet Stroller is made for you! It offers amazing features and it comes without the hassle that zippers bring! How amazing is that? Over-pamperd felines simply need this stylish cat stroller that almost reminds of baby carriages. This stroller features a removable bassinet and retractable skylight and rain cover for those rainy days. The downside of this stroller is that it’s slightly difficult to unfold and the fact that the largest viewing panel faces the back of the stroller, where the owner would be walking and pushing the stroller. A removable bassinet is ideal for transport of your furry friends, and it also features skylight and rain cover hood that will protect your pet from the elements! It’s quite spacious, so your cats won’t feel claustrophobic or cooped up in a closed space. 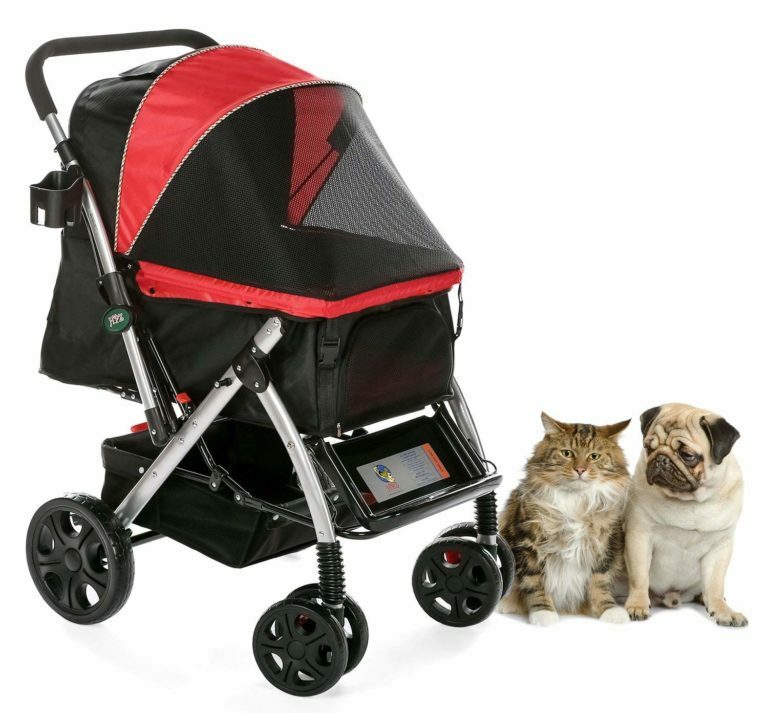 One more great stroller for you and your cats. Regardless of whether you prefer jogging or strolling through the park, this Heavy Duty stroller is the ideal fit for you. It’s ideal for cats of all sizes – it’s spacious and you’ll be able to place more than one cat. Additionally, this stroller is perfect for sick, injured or cats recovering from surgery. The plush interior keeps your cat comfortable on the road, and they can still experience all the great sights, smells and sounds they would if they were walking right beside you. In this stroller you can change the size of the internal compartment, so it can hold many cats of different size. There is a large-volume under-basket, three smaller accessory bags and a bottle holder, so there is enough storage space when you travel, go shopping, or strolling, with your beloved cats. This stroller features a one-hand simple mechanism that can quickly fold and unfold it in seconds, and takes up minimal space when folded. It also has extra-thick, heavy-duty and light-weight frame. Strong construction uses stainless steel tubes and aluminum alloys, so it is extremely durable! It features a breathable mesh top cover made of high-density odorless and UV-reflective material, including two pads for the pet compartment made of high-density Oxford polyester fabric which are comfortable, stain-resistant and machine-washable. You can choose your stroller colors from red, navy and sky blue. The good thing about this stroller is the fact that cats of all sizes fit in it. It is good for cats in need of medical attention and extra care, and it has a bunch of storage space in case you go shopping with your furry friends. In addition, it is super study and durable! Ideal for those of you who won’t mind giving some extra money for the comfort of their pets! The Pet Gear Ultra Lite Stroller is perfect for small sized pets, so if your cat is up to 15 pounds, this stroller will be ideal for you. It’s easy to storage or fold down for transport, and because it’s super lightweight it’s also very easy to maneuver and to steer. 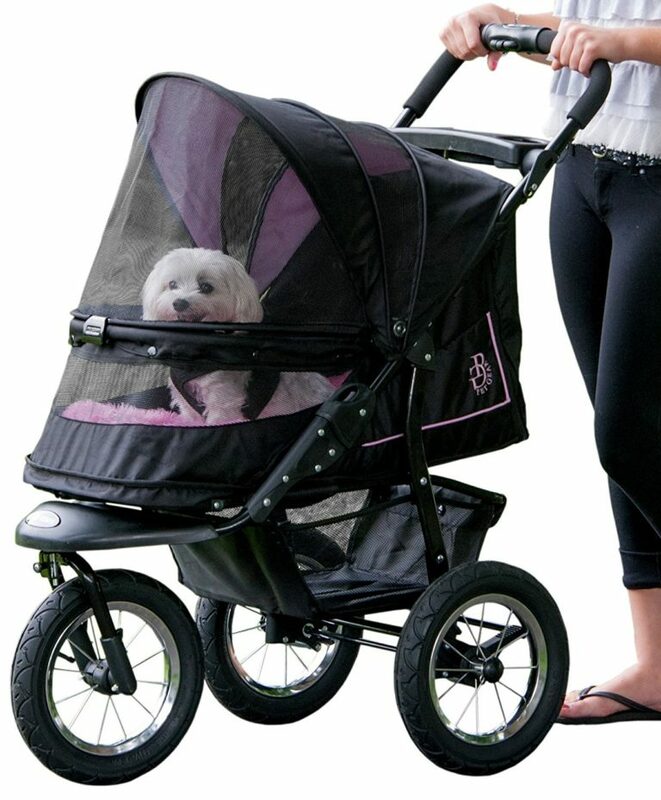 This stroller provides a great way to take your pet with you on a long walk through the park, a walk around the block, or maybe even shopping at the mall. It safely contains and protects your cat wherever you go. It also, has an easy quick-fold mechanism, waterproof tray that removes to allows you easy cleaning. It has front entry, top window and viewing area, and rear safety brakes. Super inexpensive for down town walks, plus it’s super cute. This BestPet Posh Pet Stroller accommodates pets up to 25 pounds and it features a lightweight yet durable frame. It’s super smooth to ride in and handles bumps in the sidewalk with relative ease. It comes in a variety of colors, from blue to red and even a leopard print! It is ideal if you want your pets to travel in style and comfort! If you are someone who takes their cats on short walks around neighborhood or simply short strolls to the park, this stylish stroller is made for you and your cats! This cat stroller is super cute and stylish. If you want your cats to travel in style and comfort, plus if you need a lot of storage space, this stroller is ideal for you and your furry friend! A stroller that easily opens and closes, and it can be stored and transported with ease, plus it has a great storage space – what more can you want for your pets! Additionally, it has front and rear entries, so loading your cats in is no hassle! The BestPet Stroller System features easy and fast folding. It opens or folds flat in less than 5 seconds. Featuring large, 6-inch wheels, it glides effortlessly over bumps or dips keeping your cat happier and more comfortable. It also has a large storage basket and cup holders keep toys, treats, and water bottles handy – so you can take your cats on longer strolls or trips. It can accommodate pets up to 30 pounds and it’s also available in blue or red for those wanting a splash of color. It’s a lovely choice and moreover, super affordable! 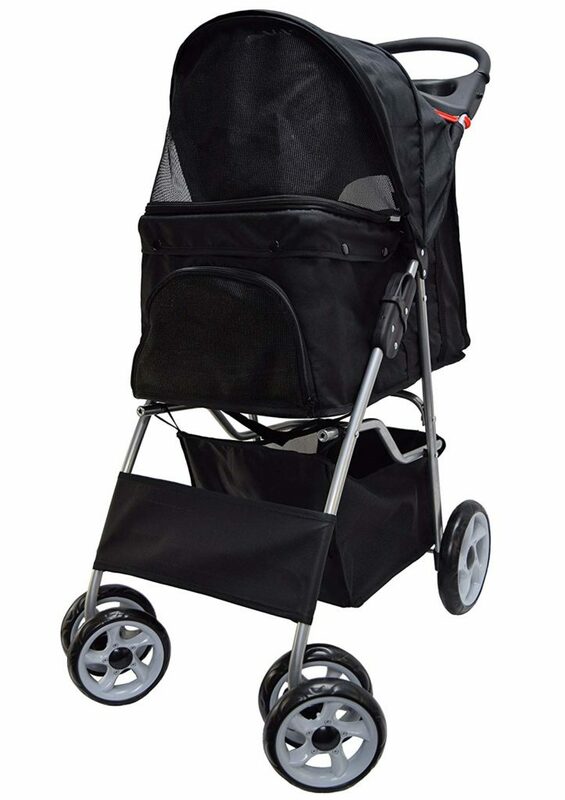 This stroller is ideal for both smooth or rough terrain because the wheels glide easily over any type of terrain. It has a durable mesh that provides airflow, visibility, and keeps insects away from your animal. Plus it feature a denier nylon which is tough and water-resistant. Will Your Cat Like Its Stroller? Whether your cat will like or dislike the stroller depends entirely on you and your cat. The character of your cat will play a big role here, but also your contribution counts. Why, you might ask? The answer to that is simple. If your cat adapts easily to new things, stroller won’t be a problem for you. But what if your cat can’t adapt easily? In that case you will need to be more cautious and go for a step-by-step solution. What you will do is slowly introduce your little friend to the stroller. This means just sitting in a stroller at first, then comes moving around your household and eventually strolling around quiet neighbourhood. As you can imagine while reading this, getting used to a stroller is no easy task. You, as a parent with a child, should be as patient as you can. What you can do to contribute to your pets liking its strollers is to ensure that you bought the right one. No one knows our cats better than we do, right? Well, when buying a stroller, everybody should consider all the little facts about their little friends and use them as a help while browsing. Bottom Line, everything that is in our power to do, as cat parents, is to ensure an extremely secure and comfortable stroller for our little furballs. This means looking at the color, fabric, quality of the straps, wheels, extra pockets for personal things and basically any detail you can think of. What we all can conclude is that our furry pets will mostly appreciate the comfort a stroller can provide. 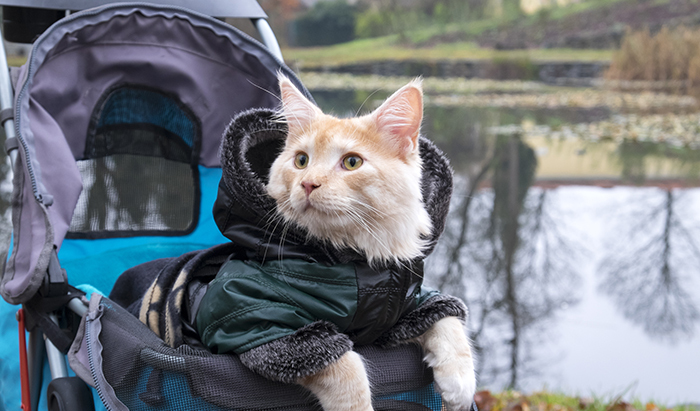 We have been mentioning a few tips through this article about teaching your cats to stroller ride, but here is a more detailed step-by-step explanation on how exactly to do it. Purchase a pet stroller that matches your cat’s size. You don’t want anything tight or too spacious since your cat should be able to easily turn around inside it, but still not have too much space. Leave the stroller inside your house, somewhere your cat passes by on daily bases. It should be placed so that it catches your cat’s eye. This way we are letting our furry friend investigate by itself. It is very important to put on your brakes so your cat doesn’t get spooked. You will notice if your cat immediately likes it. If that is the case, it won’t be able to stay far from it. On the other hand, if it doesn’t, you should probably include some supportive healthy treats as a reward each time they just sit in or next to it. If this doesn’t happen, then you should put some treats in the stroller. Your furry friend won’t be able to resist! Your cat should dictate the pace and dynamics of accepting the stroller. Don’t push it! Step by step, it will get used to it. Consider placing its bowl of food inside the stroller to build up its acceptance level. This could also work with its favorite toy or blanket. Don’t forget to constantly award and praise your cat for doing something right since that is the only way it knows it did something right. When you get familiar enough with the space and comfort stroller provides, you should start getting your cat used to being fastened to it. Just leave it sitting for a few seconds or minutes, depending on your cat’s comfort. This is the perfect treat time! After your beloved cat has completely accepted the existence of this new magical thing in their life, you should do some test movements so it realizes it is movable. When you pass this step, you might want to do few rounds inside your house just for the sake of getting used to it. Now, don’t feel defeated if your cat suddenly jumps out of the stroller at the beginning phases. Yes, it might mean your cat didn’t quite like it, but give it some time. When it jumps out you should put it back in and reward it with some kind of a treat whenever it stays put for any amount of the time. You’ve passed all the previous steps? Congratulations! Now is the time when the real fun starts! Put your cat in the stroller, fasten all the security straps, pack your stroller with treats and all things necessary and hit the road. We recommend you start off with some smaller walks around the neighborhood. Gradually you can slip in a street or two more. You should check your cat from time to time to see its reaction and according to it you should act. 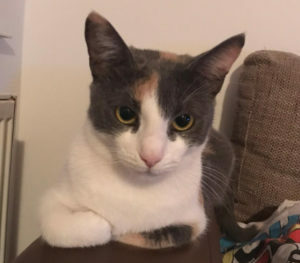 We already told you, your cat IS the boss! Our final tip would be that you time your stroller walk when the neighborhood dogs are not out. This will help minimize any kind of threat for your furry buddy. This is an interesting question! Let us explain why. Maybe you didn’t even think in the same direction, but by purchasing a stroller you provide your cat much more than you think. Elderly cats, who are not able to walk as much or at such distances appreciate strollers more than anything. Also, strollers are amazing for ill cats or cats with any kind of disability. Not only are they very helpful, but they are enjoyable for both you and your cat. You could travel the world with your buddies by your side and never again feel sorry that your cat is left behind at some nasty or brazenly expensive pet hotel or at some cousin’s home. Strollers are also a great idea for you who live in an apartment or even in a house with a small backyard. Our cats are in a constant need of exploring things and by riding in a stroller they get all the adrenalin they were counting on. Besides that, with a stroller you could bring your cat to a certain forest or whichever scenery you had in mind and take a walk of both of your dreams. Freedom here I come! Sounds unreal, doesn’t it? In the past few years strollers have become extremely popular everywhere around the world. Since there are too many options to choose from, we decided to do thorough research and write you about the best of the best ones. There are many factors we had to look at so we could pick the finest ones for you, some of those being pricing, quality, style and main purpose. We also wanted to show you there is a variety of offers. We tried to tell you more about the plain ones, but also about more extravagant ones. Our main goal was to tell you all you need to know about strollers. We also paid close attention to the reviews of costumers, whose overall feedback provides the kind of information that’s otherwise hard to find. You don’t need to worry about anything since your own preference is what matters the most. Another thing that has priceless value is whatever your beloved cat finds most comfortable. You should rely on that. We hope we contributed at least a little bit in helping you make a decision and perhaps choose a certain type of stroller. If not that, we hope you at least learned some new things about strollers and generally cat’s involvement with strollers. Bottom Line is that all of us cat owners should support and educate all the other cat lovers and in the end of the day our lovely fuzzy furrends deserve all the best we can provide them. What’s your experience with these strollers? How does your cat behave in a stroller? We welcome your comments, suggestions, and feedback.